Member of the European Parliament Gilles Pargneaux has called for the holding of a census of the Sahrawi populations sequestrated in the Tindouf camps, an operation that Algerian authorities and the Polisario Front have always rejected. The call launched by Pargneaux came in the aftermath of the publication of a damning report in which the European Union denounced the misuse by the Algerians and the leaders of their protégé the Polisario of the European humanitarian aid initially destined to the Tindouf camps refugees. This yearly assistance, extended to the camps since 1975, is worth € 10 million euros. “The diversion of the European food aid to the Tindouf camps by Polisario officials is simply outrageous,” said the president of the EU-Morocco Parliamentary Friendship Group. “It is the overvaluation of the camps populations that made it possible for the embezzlers to establish this elaborate system of diversion and resale of the European food aid”, the French MEP said. For Gilles Pargneaux, the report of the European Anti-fraud Office (OLAF) has only confirmed the information already collected on the ground by many NGOs and international pundits. He went on to say that the publication of the report “sheds light on the core of the Sahara conflict: the census of the populations living in the Tindouf refugee camps which is categorically rejected by Algeria and the Polisario despite the repeated requests made by the United Nations” and its specialized agencies. “Europe cannot be a blind and dumb donor,” he said adding that he intends to ask the European Parliament’s Budgetary Control Committee to examine the matter and shed light on what he deemed “a shameful exploitation of the Sahara conflict” by the Algerian and Polisario leaders. 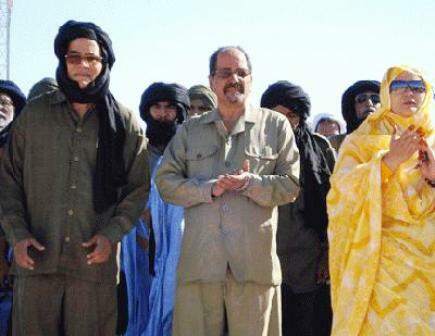 Some Algerian rulers and some senior executives of the Polisario, on top of whom Mohamed Abdelaziz and his wife, the Algerian Khadija Hamdi, have built up a huge fortune at the expense of the Tindouf refugees.